Wheelchair tables enable students with physical challenges to work and study right alongside their peers. 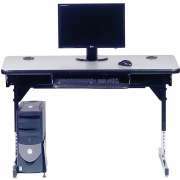 Whether in the office or classroom, wheelchair accessible tables, desks, and computer stations are becoming a critical component of the modern professional and educational environments. 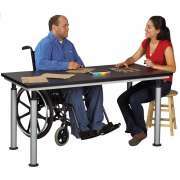 What kinds of tables can accommodate wheelchairs? 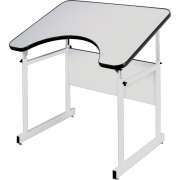 Wheelchair accessible tables do not have to look any different than other desks and tables. 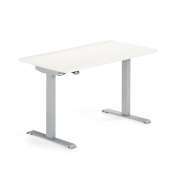 Hertz Furniture has a selection of ADA compliant tables that will fit right in with the rest of your furniture. How can I make my classroom more inclusive? Creating an ADA compliant classroom is as easy as accommodating school desks that are just a bit wider than regular classroom desks. If you know you will need an ADA compliant student desk, you should purchase other desks in the same style so your classroom will maintain a coordinated look and students with disabilities will not feel singled-out or different. Aside from the furniture itself, the learning space needs to be arranged in a way that enables someone in a wheelchair to move around the classroom easily without bumping into anything or having to move things around. What makes a school ADA compliant? It is not only the students&apos; homeroom which must be considered when arranging an accessible school. All learning venues need to be taken into account. 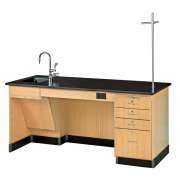 A room which will often pose a challenge if not considered in advance is the science lab. 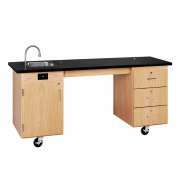 Regular science lab tables are often too high to be accessed by someone who is in a wheelchair. 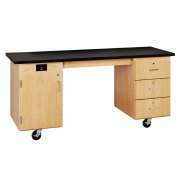 Adjustable lab tables from Diversified Woodcrafts have the chemical-resistant tops you need for safe experimentation, while also accommodating individuals in wheelchairs. 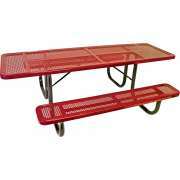 They enable you to purchase as many tables as you need and make accommodations and adjustments when necessary. How can I make the computer lab wheelchair accessible? Providing a properly-equipped computer lab requires no extra effort. 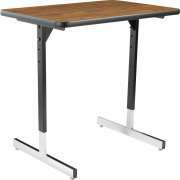 Many of our regular computer tables are ADA compliant when set up correctly. You just need to make sure that there is enough space at the table for an individual in a wheelchair to sit comfortably and work. Accessible computer tables can also be used as computer desks for professionals who need special accommodations. In addition to regular computer tables, accessible work centers are available as well. 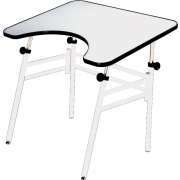 These temporary or extra computer work spaces can be used in a computer lab, classroom or office. They are available with glides or wheels. If you want extra flexibility and convenient portability, wheels are a great option. 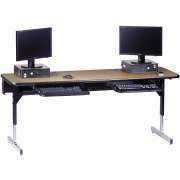 However, if you plan on leaving the computer workstation in one place most of the time, glides are the way to go. How can I make the art room wheelchair accessible? 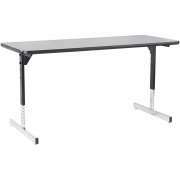 Mayline Stoway drafting tables are great for drawing, sketching and large projects. They are wheelchair-accessible so anyone can enjoy their convenient design. 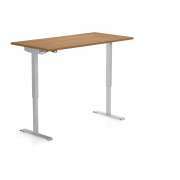 These adjustable-height tables fold flat for easy storage and mobility. They work well as an accessible option for an art room or other project space. 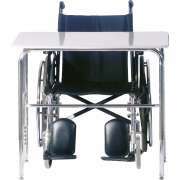 Folding wheelchair tables from Lesro can be used as classroom desks, office desks or work tables. They are height- and angle-adjustable, providing the perfect fit for anyone who is using them. A raised edge prevents writing implements from rolling off. These tables conveniently fold up for easy storage. 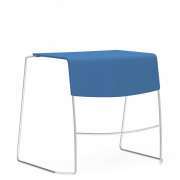 Available with optional casters or a modesty panel. ADA compliance does not end with classrooms and formal learning spaces. An accessible school must accommodate children in wheelchairs at all times of the day including lunch and recess. Our wheelchair accessible picnic tables enable all students to take advantage of the beautiful weather during lunch time or enjoy a relaxing break together. Why is an adaptive classroom important? It is not only the students with special needs themselves who benefit from accessible furniture. When you design an adaptive classroom, you teach all students about the importance of education. An adaptive classroom gives everyone a fair chance to learn, grow and gain from all of the benefits modern education has to offer. Wheelchair accessible furniture enables all students to feel welcome in your school, no matter what their physical disabilities are. 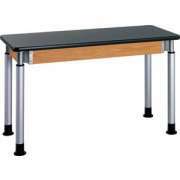 Hertz Furniture&apos;s selection of ADA compliant tables enables you to outfit your school with proper accommodations so students can learn in an appropriately-equipped environment. We know that ensuring a school is accessible can be a daunting task, that&apos;s why the Hertz Design Center is here to help you with free advice and design planning from start to finish.